At least 65 people have been killed as a result of a suicide bombing targeting a Shia Muslim rally in Pakistan’s southwest city of Quetta on Friday September 3, the latest in a string of sectarian attacks. Police said the bomber was among the 450-strong crowd and detonated himself upon reaching the city’s main square, triggering chaotic scenes, with people setting fires as others fled or lay on the ground.–AFP & Reuters Photos. QUETTA: The death toll from a suicide attack on a Shia Muslim procession rose from 56 to 65 overnight as critically wounded people died in hospital, police said. Police official Mohammed Sultan said Saturday that about 150 people were wounded and some remain critical after the attack claimed by the Pakistani Taliban in the southwestern city of Quetta. A triple suicide attack Wednesday night killed 35 people at a Shia procession in Lahore. Leaders of the minority sect called a general strike in Quetta and all schools are closed for a day in mourning, police said. 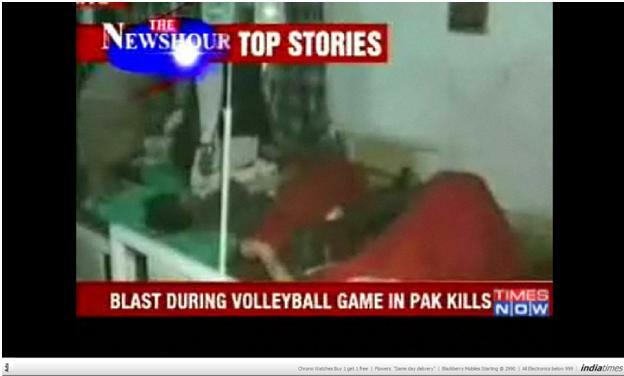 CNN Reports : Death toll from Pakistan suicide bombing rises to 73 : [See Some Video after clicking here]. Courtesy : AP. AFP, Rueters, CNN and Dawn. 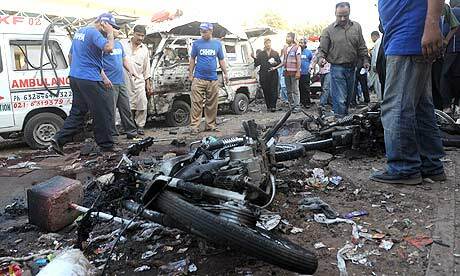 Children, Women, Aged killed in twin blast in Karachi. 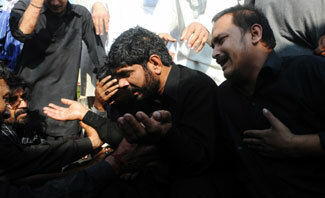 Shia mourners under attack of Sunni militants. Hospital under Attack, 25 killed 100 injured. KARACHI – A tragic twin blasts powerfully wreaked Karachi on Friday, targeting a bus first and then a hospital where casualties were rushed for treatment, killing 25 people, including women and children, and injuring scores of others in the second assault on Shia mourners in this mega City in weeks. It is a very clear fact the Sunni militants attacked the Shiite mourners to quench their thirst for Islamic blood. The Islamic militants are not satisfied with the Kaffir blood any more. On Friday – the very pious prayer day for both the Shia and Sunni Muslims, an explosion in Karachi targeted Shia mourners on their way to a Chehlum procession. 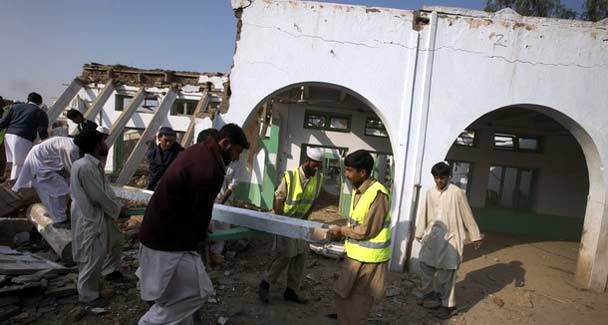 A second blast hit the main public hospital where causalities from the first blast were being taken. 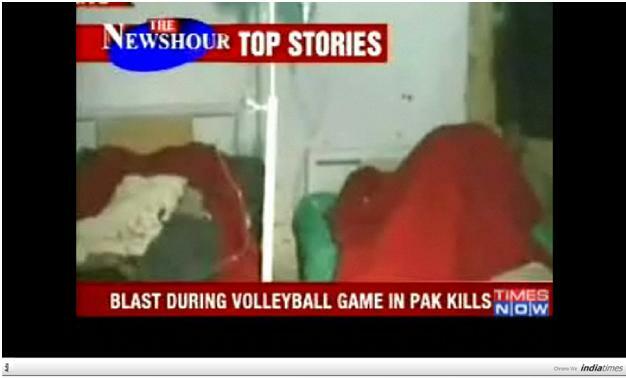 According to agencies, the latest death toll is 25, while nearly 100 people were wounded in the twin blasts. These attacks come just a month after a blast killed more than 30 people during an Ashura procession in the city on December 28,2009. There were conflicting reports about the nature of the blasts as bomb disposal squad officials claiming these were suicide attacks while Interior Minister Rehman Malik said it did not appear so. He said investigation was under way to establish the nature of the blasts, reported a private TV channel. The first blast occurred on Nursery Bridge near FTC building at 3 pm where a bomber, as per the bomb disposal squad officials, rammed his motorcycle into a bus carrying 40 mourners who were going to join Chehlum procession on MA Jinnah Road. As a result, 13 people including women and children were killed and dozens injured. Parts of the destroyed motorcycle were found near the partially damaged bus. The blast was so intense that windowpanes of nearby buildings were broken. Phase …….. (1) of current Islamic Peace process. The victims of the bus blast were taken to Jinnah Postgraduate Medical Centre (JPMC) where the second blast occurred at 4:55 pm in the parking area of the hospital emergency, killing 12 people. Phase …….. (2) of current Islamic Peace process. Police high-ups remained tight-lipped and they have not officially spoken a word about the nature of the blasts. Sources in the bomb disposal squad said that a man riding a motorbike was wearing a suicide jacket that contained 15kg to 20kg explosives. 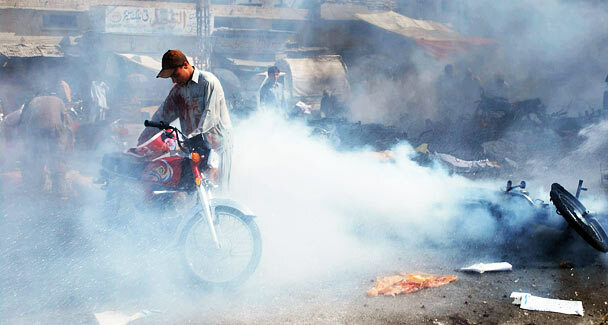 About the preliminary investigation, SP Mazhar Mashwani of Crime Investigation Department (CID), when contacted, said that the engine and chassis numbers of the motorcycles used in the blasts were tempered with while parts of the motorcycles have been taken from the crime scenes for the chemical examination. 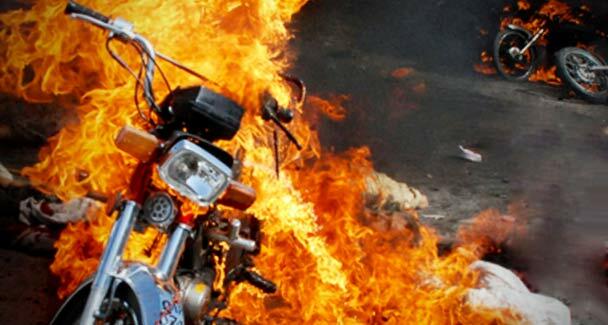 BDS official Munir Sheikh said that the attacks were carried out by suicide bombers on motorcycles. Body parts of the alleged bombers were found from the spots, he said and added that 15kg to 20 kg explosives were used in the first blast while around 10kg explosives were used in the second blast. There was utter chaos at the scene of explosion on the Mohtarma Laig Begum Road which leads to the Justice Nizam Flyover just off Shahrae Faisal. The blast occurred at around 3:00 pm when an explosives-laden motorcycle reportedly hit a passenger bus carrying participants of the Anjumane Azaraan (Shia participants marking the Chehlum of Imam Hussain, a significant religious occasion). 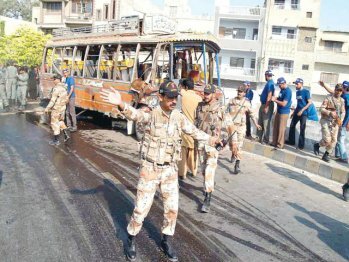 As police and Rangers took up positions to secure the area in the aftermath, a large number of Shia mourners reached the spot from M.A. Jinnah road where the main procession was taking place and started raising slogans against the authorities. The mourners, however, remained peaceful and there were no reports of rioting or looting. Although eyewitnesses were unanimous in their view that explosives were mounted on a motorcycle which struck the bus as it passed by, some said they saw a bike rider chasing the bus which exploded on striking it. It was evident that the bus bore the brunt of the first attack and most casualties were the passengers sitting inside. However, the bus did not go up in flames. The steel structure was bent from many places outside and the glass windows were shattered. All that was left inside were bloodied slippers, shirt pieces and symbols of the Shia religious procession like small knives, the panja (hand palm sign) and cloth inscribed with verses. About 100 meters away from the bus, a shop was partially damaged. It was there that Abbas was sitting by the roadside crying hysterically. “I was in the second bus coming right behind the one which was hit by the blast. My elder brother was on that bus…I think he’s dead,” he said. 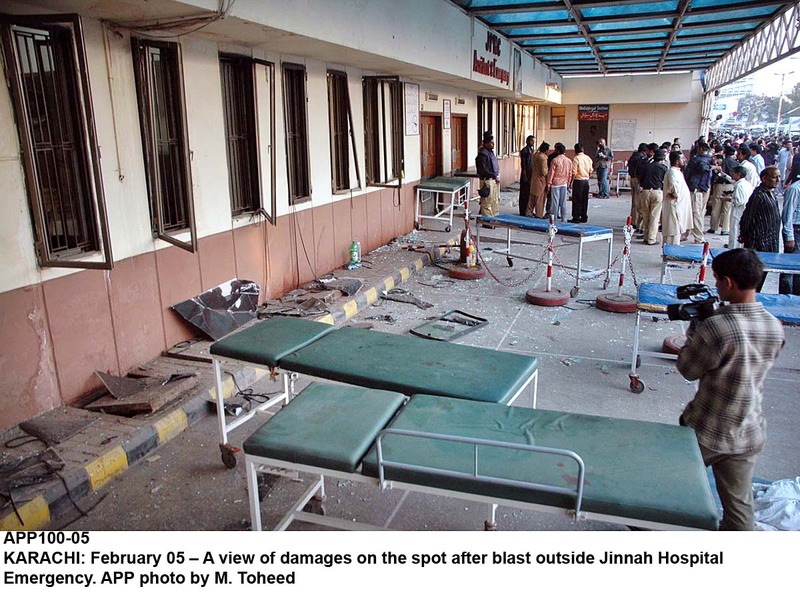 The dead and injured were shifted to Jinnah Postgraduate Medical Centre (JPMC), which is only a few minutes away from the site of the first blast. Head of Emergency Unit, Dr. Seemi Jamali, confirmed that 12 people arrived dead, while over 50 persons were being treated for injuries. At the hospital, in a repeat of the Ashura tragedy, enraged mourners marched into the emergency room chanting ‘Labaik Ya Hussain’ (I am here, Imam Hussain). They surrounded the dead bodies and beat their chests angrily. A doctor on duty at the resuscitation unit informed that most of the injured had suffered bomb pellet wounds on the head, chest and limbs. There were no gunshot wounds. Many of the injured were not in a position to talk. Most had just a name tag slip pasted on their sheets as doctors pierced drips into their arms and people thronged their beds hoping they were not their dear ones. Middle-aged Zahoor was one such victim who was calling out in pain the names of his family members. 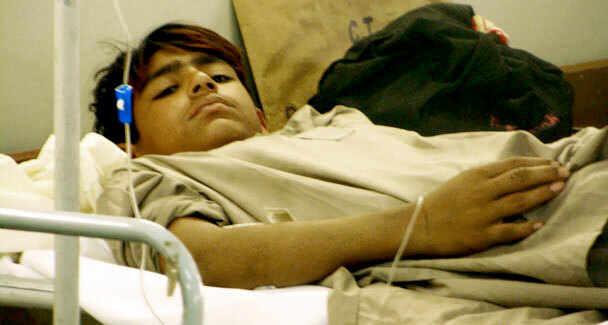 Blood was still dripping out of Qaiser Abbas’s head and fingers. “I was in the bus,” was all he could utter when asked about the incident. Kazim, a young child of about six years, was crying for his mother. His face was bruised by shrapnel. Thirty-year-old Ali Abbas was inconsolable. “I can’t find two of my brothers, Ahmed Abbas (23) and Nayyar Abbas (20). Both of them were on the bus.” Only a few minutes later, he was told that Ahmed was dead. Asghar Ali, a man in his late twenties, was devastated. He was screaming in tears in a corner of the room where the dead bodies were kept. “My whole family has died today,” he said. “My paternal uncle, nephew and cousin are all among the dead,” he said, adding that their names were Anjum, Ali Raza and Qadir. As tempers flared inside the unit, some doctors were scolded by the enraged people for not treating their injured quickly or adequately. “The people inside should understand that they are hampering our rescue efforts by barging in like this,” said one visibly harassed female doctor. 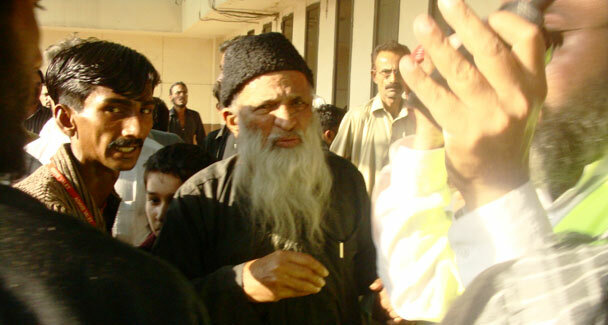 The philanthropist, Abdus Sattar Edhi, also reached JPMC to oversee the rescue efforts of his team of paramedics and ambulance drivers. He too tried to pacify the mourners, but in vain. “Why don’t our people understand that by coming in an emergency room like this, it becomes all the more difficult for doctors to save the lives of their loved ones. It is also not safe,” Edhi said. Minutes later the second blast took place outside the main entrance of the emergency room. Paramedics were shifting the injured inside the hospital when the explosion took place just across the gate near an Edhi booth and ladies toilet. Ambulances and some motorcycles were places outside at the time of the incident. At least five people died on the spot, while at least a dozen others, including paramedics suffered injuries. Mehmood, a paramedic for the CHIPPA service, had an emotional breakdown after the second blast. “My friend (and paramedic) had just crossed over to the ambulance parked on the other side when the blast took place. I wish it was me and not him. Why did they target us? We were just helping out others,” he cried. Shahnawaz, a paramedic, said he carried the dead body of a teen-aged boy from the second blast site towards Civil Hospital (CH). Paramedics lamented the fact that the route to the CH was blocked by the police for security reasons for the Chehlum procession and they were not let in despite the second blast that took place at Jinnah. “The police should have opened up at least one route so that the ambulances could reach Civil in the shortest time possible. But they didn’t listen to us. We instead had to go all the way up to Tower and go through narrow streets to reach the hospital. I think some of the injured from the second would have succumbed to their injuries because of this reason alone. Three dead bodies were brought to the CH till the filing of this report. Security was significantly beefed up at the hospital this time around and no one, including media persons were allowed inside the emergency unit. A bomb found in Jinnah Hospital defused later. Dr Shafiq-ur-Rahman informed on the phone that he was treating three critically injured patients in his operation theatre. He said most of the victims had wounds on their chest and that his team was trying their best to save them. The Muslims cannot settle their dispute among the Shia and Sunni, but they claim the International brotherhood between the humanity. All these are bogus claims so far, as the Islamist of Pakistan and other places show their ugly nature of brutality to kill the opposition so cruelly that made the Doctrine of Islam as enshrined in Koran is nothing but a “SATANIC VERSES” again and again. These are the present stories of Karachi, Pakistan, Somalia, Indonesia, Malaysia, Yemen and other parts of the world infected with acute Islamities. Three-day mourning: A spokesman for the Sindh education minister announced that schools and colleges in the province would remain open on Saturday. Separately, the president and the prime minister also condemned the blast as the ANP and the MQM announced three days of mourning. Shia strike: According to a private TV channel, the Jaafria Alliance would go on complete strike in Karachi today (Saturday) to protest against the blasts. The alliance has also given the government a 48-hour deadline to take action against those responsible. In addition, the media reported that transporters and businessmen in Karachi would suspend their activities today in protest at the attacks. The US embassy in Islamabad also condemned the terrorist attacks. Courtesy : Dawn, The International News, Daily Times, APP, Reuters, AFP & Others. Friday suicide attacks kills 47 in Pakistan on New Year day. Great Talibani style to start with a new year. At Least 10 minors were killed in the blasts. Agencies || Friday, January 01, 2010, Muharram 14, 1431 A.H at 1949 hrs || Source:Indian Express, Times Now & Others. In a bloody start to the new year, Pakistan on Friday witnessed a major terror attack when a suicide bomber rammed his explosives-laden vehicle into the wall of a playground in the country’s northwest killing 27 people and injuring several others. At least 9 minors were killed in this incident as believed. In a separate attack, a tribal elder associated with an anti-Taliban militia and five others were killed when the vehicle they were travelling in was targeted with a roadside bomb in the restive Bajaur region. Tribal elder Malik Gul Shah Ali Khan and five others, including a minor boy, died when the vehicle was targeted with a remote controlled bomb in Salarzai sub-division of Bajaur Agency this morning, officials of the local administration said. The suicide attack occurred at Shah Hasankhel village, located 25 km from Lakki Marwat in the southern part of the North West Frontier Province. 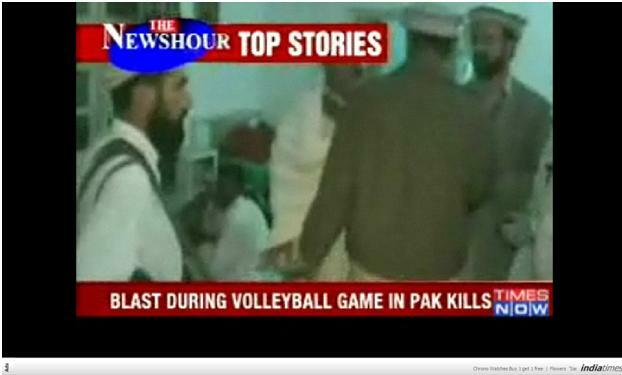 About 50 people were watching a volleyball game between two local teams when the bomber struck the playground’s wall with his vehicle. State-run PTV reported that 27 people were killed while police officials said several others were injured. Several houses collapsed due to the powerful explosion and some people were buried in the rubble. Officials said the death toll could rise. No group claimed responsibility for the attack but police officials said they suspected the Taliban were behind the assault as local residents had cooperated with security forces during a recent operation against militants. District police chief Ayub Khan said residents of Shah Hasankhel and members of a pro-government militia had expelled militants from the area with the help of security forces. The village was earlier considered a stronghold of the Taliban. Today’s attack was the latest in a series of devastating suicide bombings across Pakistan that has killed over 500 people since October last year. Prime Minister Yousuf Raza Gilani condemned the attack and said such terrorist acts would not weaken his government’s resolve to fight terrorism till it is completely eliminated. In Hangu district of the North West Frontier Province, two militants were killed while planting a bomb, police said. The militants were planting the bomb beside a road when it went off with a loud bang. Both men were killed instantly. Police took their bodies into custody. Meanwhile, at least eight militants were killed in US drone attacks in the troubled North Waziristan tribal region, a Taliban stronghold. A missile fired by a drone struck a vehicle near Navana village in Mirali sub-division this morning, killing three militants. 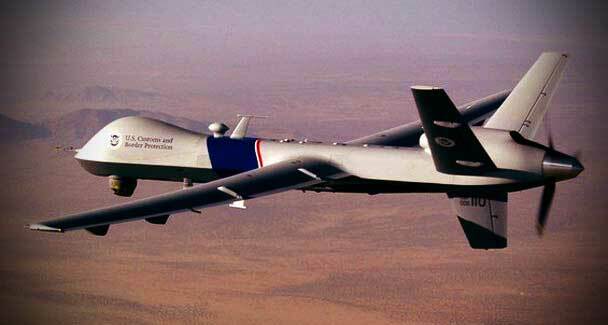 Five militants were killed last night when a drone fired two missiles at a compound at Machikhel village in Mirali. It is reported that at least ten minors are killed in the first Friday Islamic attacks in Pakistan in the very start of the year 2010. 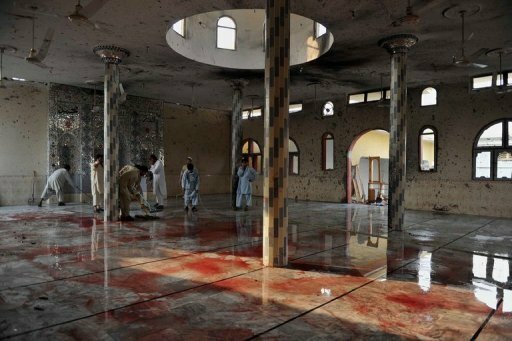 12 dead, 30 hurt in Dir mosque attack on praying Muslims. 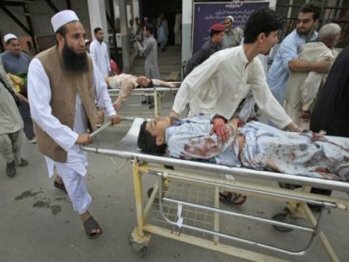 Twelve killed, Thirty hurt in Dir mosque blast at Friday Prayer. PESHAWAR: At least 12 people were killed and 30 injured when a bomb ripped through a mosque in northwest Pakistan as people gathered for Friday prayers, as the sources said. But the Pakistanipolice and government officials tried their level best to lower down the numbers of victims as “four people killed and 28 injured” bashfully to save the truncated face of its failure administration against barbaric Islamisation or Talibnisation of Pakistan through a series of Friday Prayer Hits. At least 12 people were killed and 30 other wounded when a suicide bomber blew himself up in a mosque situated in Khurshid Police Line, Temar Garah. According to sources, the blast took place outside the Police Line mosque. Idrees Khan, Deputy Inspector General of Malakand, confirmed it was a suicide blast. He, however, added that the bomber failed to hit his target due to tight security. DPO Lower Dir, police officers and other security men were among the people, who were offering prayers in the targeted mosque. 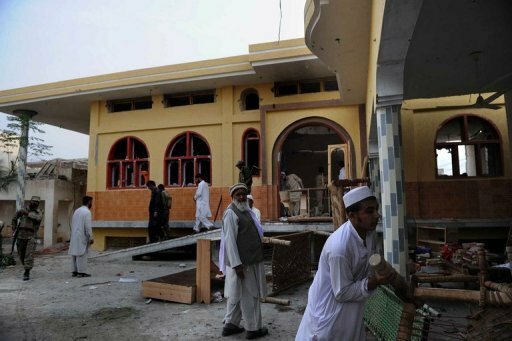 The blast has devastated the mosque also. DPO Mumtaz said that 12 people were killed and 28 others injured in the blast. Two children are also among the dead. The Medical Superintendent of District Headquarter Hospital, Dr Wakil, said that out of 28 patients brought to the hospital, eight are in critical state. 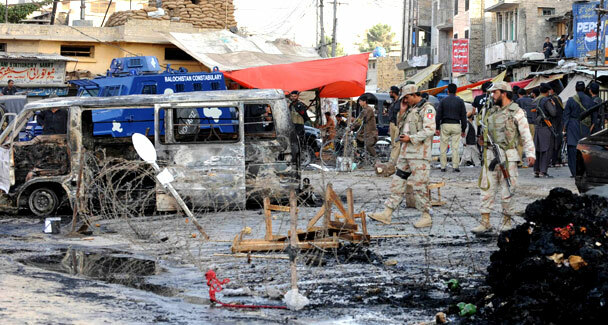 Following the blast, security forces cordoned off the site of blast and collected the evidence. Condemning the blast, NWFP Chief Minister Ameer Hyder Khan said that no Muslim could even think of killing his innocent fellow Muslims inside the mosque. He said the terrorists, bewildered by their possible defeat, were carrying out vengeful acts of terrorism. Hospital officials put the injured toll at 28 in the latest bombing in Pakistan’s northwest, where the military is this year pressing multiple offensives against Islamist militants behind a deadly insurgency. More than 2,700 people have been killed in attacks in Pakistan since July 2007, with the past three months seeing a surge in suicide bombings targeting civilian and security targets by militants avenging the army onslaught. At the fag end of 2009 the Muslims of Pakistan saw at least seven times Friday Hit on Mosques and several blasts on Friday ( the most holiday in the week as per Islamic belief ) in a single year, which took thousand Muslim lives to strengthen the profound Islamic foundation in Pakistan. Is this not a time in the very start of a new Islamic year (first day of the new Islamic year will fall on Saturday 19th instant, i.e. 1st Muharram) to raise the voice of Muslims against Islam of this kind ?? PESHAWAR: Security forces backed by fighter planes bombed suspected Taliban’s hideouts in Orakzai tribal region, killing 14 extremists, and injuring several others. According to sources close to security forces, helicopter gunships shelled militants’ dens in Ghajo, Dabori and Mamozai areas of Orakzai Agency, in which 14 militants were killed. On the other hand, two dead bodies have been recovered from Mamozai area. They have been identified as Hazrat Ali and Misri Khan. 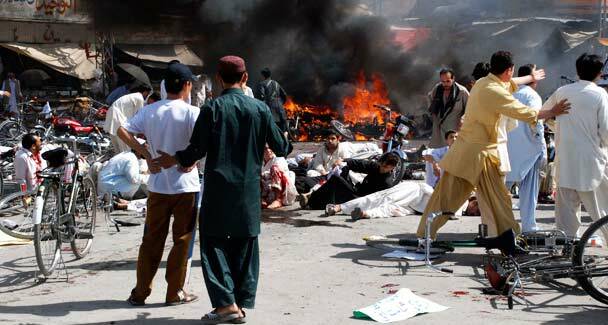 Policemen survey the side of a suicide bomb attack in the town of Bannu as residents watch. —File Photo by Reuters. 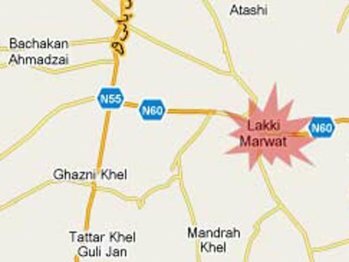 LAKKI MARWAT: The district nazim of Lakki Marwat and his family members narrowly escaped a suicide attack in Isakkhel village here on Thursday as the bomber slipped and his jacket exploded prematurely, killing no one but himself. Eyewitnesses and police said that District Nazim Qudratullah Khan was sitting in his hujra among a large number of people when the suicide bomber tried to target him. ‘It was a suicide attack,’ DPO Mohammad Ayub told Dawn. He said the bomber entered the hujra and was trying to approach the nazim, but luckily his foot slipped and he fell down. The explosives tied to his body went off, he said. The district police chief said that they had found head and legs of the bomber. Police took the body parts into custody and sent them for test. He said that only a part of the suicide jacket exploded, while explosive wires, packet of knives and hand grenade were recovered from the killed attacker. He said if the suicide vest exploded completely there would be huge losses of lives as more than 60 people were present in the hujra at the time of explosion. The DPO said that a stone was also recovered from the attacker. The name of the village ‘Isakkhel’ was inscribed on the stone which indicated that the family members of the district nazim were the apparent target, he added. The father of the district nazim, Haji Mohammad Aslam, a key member of Marwat Qaumi Jirga, brother Haji Hidayatullah Khan and other family members besides the nazim himself were present in the hujra to receive government officials and other guests, who had come to congratulate the nazim and his brother on performing Haj. It may be recalled that former member of National Assembly and key leader of Marwat Qaumi Jirga, Naseer Mohammad Khan, was injured in a bomb blast in the area few days ago. This is why Swiss ban on Mosque Minarets. World doesn’t want to have Friday blasts and genocides under any Minaret. Friday Blast in Rawalpindi Mosque. 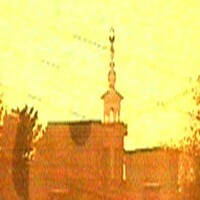 At least 35 dead as militants strike Rawalpindi under Mosque Minaret. Again Islam ghastly took lives of Muslims in prayer on Friday. Oh! what a religion of Allah and his Prophet (Peace be upon Him) !!!!!!! And come to destroy all our Peace !!!!!!!!!!!!!!!!! 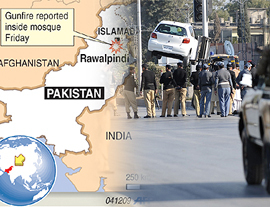 RAWALPINDI,Friday, 04 Dec, 2009 : At least 35 people were killed Friday when suicide bombers stormed a packed mosque in Rawalpindi, firing on worshippers and detonating explosives, officials said. The brazen raid by at least three attackers came as people gathered for Friday prayers in the city adjoining the capital Islamabad. 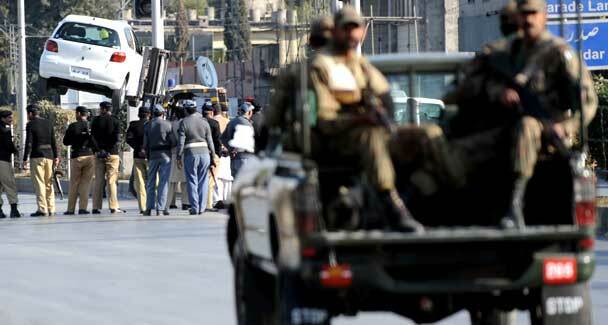 Rawalpindi is also home to the military headquarters and is a frequent target of Taliban attacks. 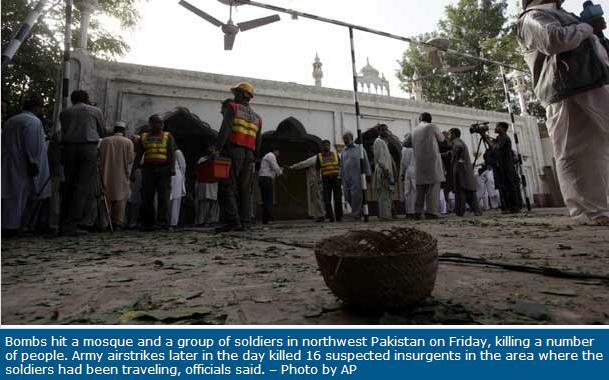 Army spokesman Major General Athar Abbas told AFP that between three and five gunmen launched a strike on the mosque frequented by military officers. The area was cordoned off as soldiers searched for more attackers. Witnesses reported at least five blasts, while Interior Minister Rehman Malik told a private television channel that the bombers disguised themselves as worshippers before launching their attack. ‘There were two suicide bombers and the roof of the mosque collapsed…they are taking revenge for the Pakistan army’s successful operations in Swat and Waziristan regions,’ Malik said. Pakistan is in the grip of a fierce insurgency, with more than 2,570 people killed in attacks in the last two-and-a-half years. Suicide bombs and attacks have intensified this year as the military pursues offensives against Taliban strongholds across the lawless northwest. An AFP reporter at the scene said that security forces had set up a secure perimeter around the site, with helicopters circling overhead and security forces preparing to enter the area to flush out any remaining militants. Abdul Waheed, an official at a nearby traffic police office, said their building was shaken by a huge blast at around noon. ‘We rushed out and saw that the blast was inside the mosque. 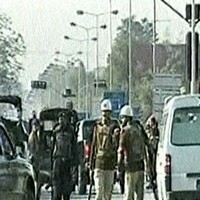 A few moments later five more blasts were heard,’ Waheed told AFP. ‘According to our estimate, some people had attacked the mosque and a few of them were hiding in a different area of Parade Lane,’ Waheed said, referring to the area where the mosque is located. Another eye witness, Ishtiaq, told a private television station that he was inside the mosque when he heard several blasts. ‘There were about 200 or 300 worshippers in the hall. Army officials mostly offer their Friday prayers in this mosque,’ he said. 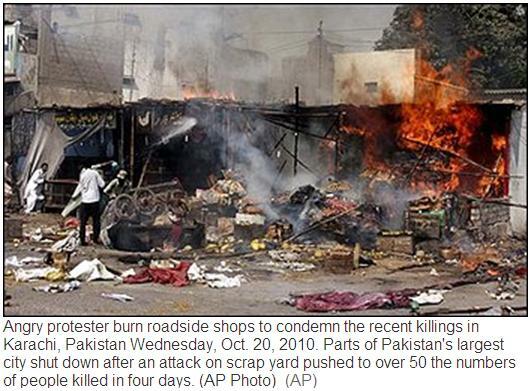 In October, militants stormed the army headquarters in Rawalpindi, sparking a day-long siege which left 22 people dead. A suspected Taliban suicide attack on a mosque near Pakistan’s army headquarters killed at least 40 people and wounded dozens of others today. It was the latest in a wave by Islamist insurgents that has left more than 400 dead in Pakistan since October, and a bloody reminder of the resilience of militant networks despite army offensives in the regions bordering Afghanistan. At least four attackers took part in the assault inside a heavily fortified area in the garrison city of Rawalpindi just a few miles from the capital Islamabad. 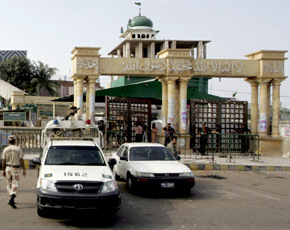 Two of the militants entered the mosque, which had up to 200 worshippers inside, while others ran into buildings nearby. Security forces exchanged fire with the assailants for an hour before they blew themselves up. Nasir Ali Sheikh saw the attackers as he walked to the mosque to pray. He said they were dressed in traditional Pakistani clothing of loose pants and a long tunic and carried hand grenades, automatic weapons and ammunition belts slung around their shoulders. The mosque’s walls and prayer mats were covered in blood and shattered glass littered the floor. The attack was the third in Rawalpindi in the last two months. In the most high-profile incident, a team attacked the army headquarters on October 10 and held dozens hostage in a 22-hour stand-off that left nine militants and 14 other people dead. Today’s attack began when several gunmen staged an explosion to break through a checkpoint close to the mosque. Two of them were able to enter the mosque and sprayed the congregation with gunfire and grenades. Violence in Pakistan has escalated since the army launched an offensive in mid-October against Taliban in the north-western tribal area of South Waziristan near the Afghan border. Soldiers have pushed deep into what was a militant stronghold, but many insurgents appear to have fled. RAWALPINDI: At least 40 people have been martyred, including 16 children, and over 80 others injured in a terrorist attack at Parade Lane mosque in Rawalpindi. DG ISPR has put the death toll to 35 including six officers, three policemen and 16 children. While four terrorists were also killed in the retaliatory attacks. The fire and hand grenade attack in Rawalpindi mosque left 40 people martyred and 83 others injured, RPO Rawalpindi Aslam Tarin confirmed. According to police sources, terrorists riding on a silver-colored car entered Parade Line area at 1pm on Friday. They entered the colony by using a ladder with the boundary wall. As soon as the Friday prayers began, they barged into the mosque and hurled hand grenades at the people followed by indiscriminate firing. Immediately after this, they blew themselves up with explosives, killing 40 people, including 16 children, and injuring 8others. The injured were rushed to Military Hospital, CMH Hospital and GHQ Hospital. Security forces, after receiving reports about the attack, cordoned off the area and killed the four attackers. During this, military helicopters hovered over the area. Security forces also seized a car from the site of attack, which is suspected to have been used by the terrorists. A portion of the mosque caved in as a result of the attack. A former vice army chief General (retd.) Muhammad Yousuf is also among the dead. He sustained injuries in his arm. While a serving Major General was among the martyrs. Courtesy : Dawn. AFP. AP, The International News, Aworldnews. 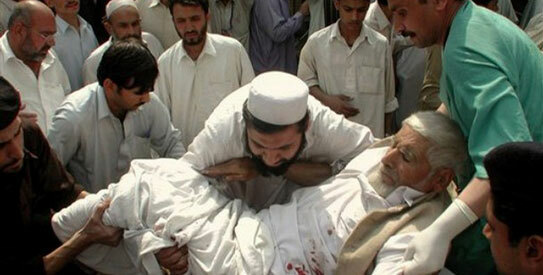 Eight killed in drone attack in North Waziristan, Not a good day for Taliban. Friday, 20 Nov, 2009|| Dawn News. 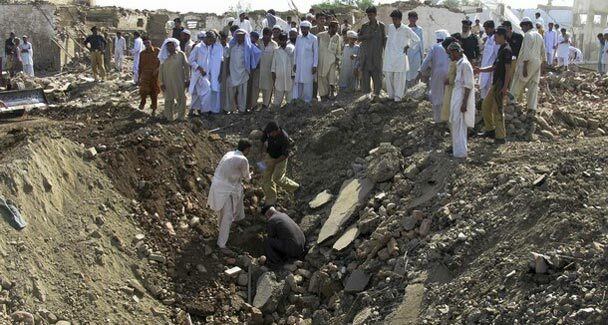 MIRAMSHAH: Eight people were killed when a US drone fired missiles into the Pakistani tribal area of North Waziristan on Friday, DawnNews reported. The strike took place in Mir Ali village, some 16 kilometres northeast of Miramshah, the main town of the North Waziristan tribal district, a senior security official told AFP. KHAR: Four soldiers were killed when militants stormed a security post in a troubled tribal region bordering Afghanistan, officials said Friday.Armed with heavy weapons and rockets, militants launched the attack on a post in Chinar town in the Bajaur tribal region, local administration chief Ghulam Saeed Khan told AFP. ‘Four soldiers were killed and three wounded,’ Khan said adding that troops retaliated killing six attackers. Security officials, confirming the casualties, said the attack was mounted late Thursday. ‘Militants first lobbed rockets and then moved close to the post and opened fire with heavy weapons,’ one official said. Militants have recently stepped up attacks on security forces and government installations in Bajaur, one of Pakistan’s seven semi-autonomous tribal districts considered a stronghold of Taliban and Al-Qaeda-linked extremists. The violence has surged since Pakistan launched a major offensive in the Taliban bastion of South Waziristan on October 17. Officials say the aim is to distract the army’s attention from South Waziristan. In February, the army declared a major six-month operation in Bajaur successful. But violence continues to rock the region. Pakistan’s semi-autonomous tribal areas have been infested by hundreds of extremists who carved out safe havens after the ouster of Afghanistan’s hardline Taliban regime in a US-led invasion in 2001. — AFPAnother security official confirmed the drone strike, but had no details about the target or casualties. 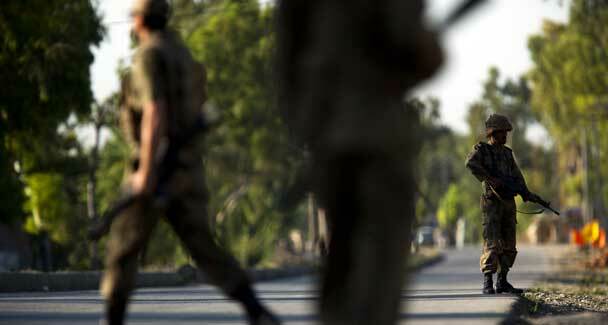 PESHAWAR: Seven security personnel were among 11 people killed when a suicide bomber rammed an explosive-laden vehicle into ISI’s regional headquarters on the Khyber Road on Friday. At least 80 people were injured. The bomb attack in Peshawar destroyed the three-storey ISI building and adjoining barracks and damaged offices and houses in a large area. A police official said the bomber blew up his van at about 6.45am near a security checkpoint at the entrance of Inter-Services Intelligence agency’s building on the highly guarded Artillery Road in the cantonment area. An official of the bomb disposal unit, Malik Shafqat Mehmud, told Dawn that about 400kgs of explosives mixed with trinitrotoluene had been used in the attack. According to ISPR, seven military personnel were among 11 people killed when the van was rammed into the military checkpoint. According to sources, bodies of five security personnel were brought to the Lady Reading Hospital and two who hade suffered serious injuries died there. Five of the 47 injured people in the hospital were in critical condition. Two women and a child were among the injured. 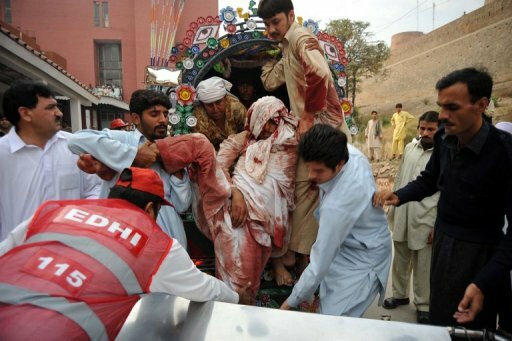 Twenty-nine of the injured were taken to the Combined Military Hospital and six to the Khyber Teaching Hospital. Those killed in the attack included Syed Adnan Ali Shah, Lal Zeb, Shafi Mohammad, Nimatullah and security guards Suleman Shah and Khan Afzal. Questions were being asked how the explosive-laden vehicle could enter the sensitive area which had numerous checkpoints manned by armed forces’ personnel. Security personnel cordoned off the area and did not allow media persons to go near the site of the attack. The Khyber Road was blocked and traffic was diverted to other roads. An official at the East Cantonment Police Station said the blast had left a deep crater near the building’s main gate. He said a van or a water tanker might have been used by the bomber, but there was no eyewitness account. He said the vehicle apparently went to the place from the wrong side of the road. ‘The explosion left a seven-foot deep and 11-foot wide crater,’ a security official said. He said that security guards had fired at the approaching vehicle but failed to hit the bomber. The roof of a nearby two-storey building collapsed after the blast. Several people suffered minor injuries from shards of windowpanes in their houses in Falcon Colony on the Warsak Road. A resident said that at least 30 people in the colony had received minor injuries and almost all the 40 houses had been damaged. Some residents of the colony have moved to other areas. Shops, offices and swings at the Army Stadium, across the road from the place of the attack, were also damaged. Windows of the Peshawar Press Club, over 1km away, were also shattered. BANNU: A suicide bomber rammed a vehicle packed with explosives into a police station in Bannu on Friday, killing five policemen plus three others and trapping many persons under the rubble, police said. 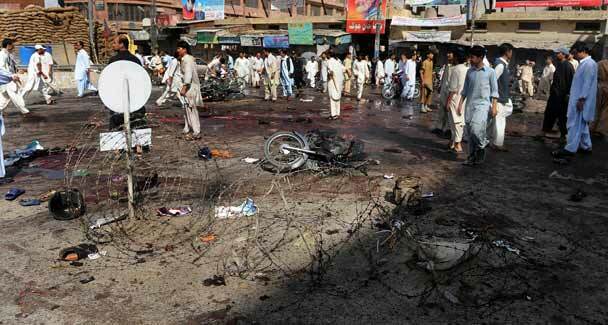 ‘The bomber rammed the car into the police station,’ Bannu police chief Iqbal Marwad told AFP from the garrison town. ‘There are three policemen dead and 12 injured. The number of casualties is likely to rise because the injured are being pulled out from the rubble of the police station,’ he added officially. BANNU: The death toll of a suicide attack at a police station in Bannu has reached to seven, DPO Muhammad Iqbal said. Five security men are also among the deceased. According to sources, a suicide bomber rammed his car into Bakka Khel police station building at Rangsa Road in Bannu. The building of the police station has completely destroyed in the attack. SHO Riaz Khatak and some of the inmates were also included in the injured. 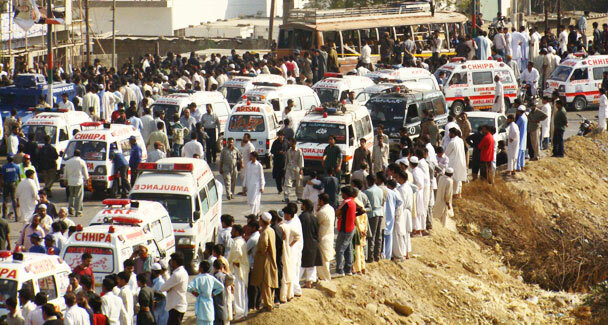 The bodies and injured were shifted to district headquarter hospital Bannu where emergency has been announced. Bakka Khel police station is situated at the border of Bannu and semi tribal area; therefore it is a sensitive police station. There were prior reports of attack on the police station. From possibility it appears to be a suicide attack, Bakakhel police station building has been damaged very badly, eight persons including five security men are dead and twenty others are injured,as the sources told to the Media. Anti-tank mine kills 15 in Mohmand,6 others were also wounded when a vehicle carrying passengers to a wedding hit an anti-tank mine. 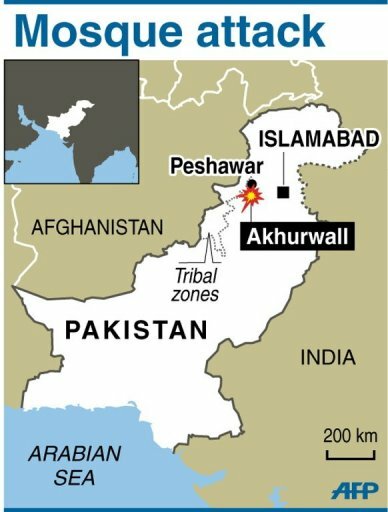 PESHAWAR: An anti-tank mine exploded Friday under a minibus, killing 15 wedding guests on a road used by government forces in Pakistan’s tribal belt on the Afghan border, officials said. The incident took place at Baizai Tehsil in the Sorandara area of Mohmand, where security forces have been pressing an offensive against rebels in what is part of Pakistan’s tribal belt, where al Qaeda-linked militants are holed up. ‘A vehicle carrying passengers to a wedding hit an anti-tank mine, killing 15 people and wounding six others,’ a senior local administration official, Maqsood Khan, told AFP. Another senior administration official, Rasool Khan, confirmed the incident and number of casualties. Most of the dead were women and children, he said. The bodies of those killed and the injured have been shifted to the Ghananai Hospital. The same road is used extensively by Pakistan’s paramilitary Frontier Corps (FC), which demolished several houses of suspected militants in the Sorandara area during raids Thursday. Security forces launched a huge operation against militants in Mohmand and Bajaur last August. In February, they said Bajaur had been cleared after months of fierce fighting, but unrest has rumbled on. ISLAMABAD: A suicide bomber struck near a major air force complex in northwestern Pakistan Friday, killing seven people as the army pressed ahead with a major anti-Taliban in close to the Afghan border. 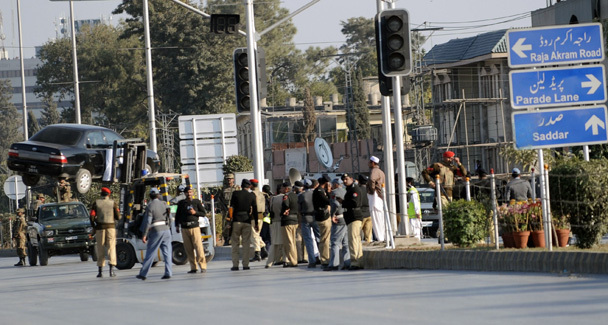 The attack happened outside the Pakistan Aeronautical Complex (PAC) in Kamra Cantt, DawnNews reported. 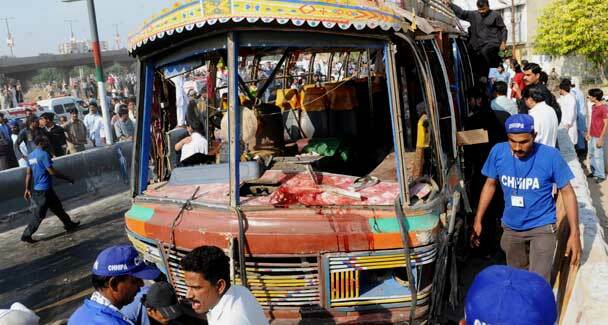 ‘There was a suicide attack and at least seven people have been killed,’ said district police officer, Fakhar Sultan. ‘Two Pakistan Air Force personnel are among those killed in the attack,’ he told AFP. The attack was the latest in a wave of bombings and raids sweeping Pakistan targeting mostly security-related institutions that has killed more than 150 people. The Pakistan Aeronautical Complex at Kamra is the country’s major air force maintenance and research hub. Some foreign military experts have mentioned it as a possible place to keep planes that can carry nuclear warheads. The army, which does not reveal where its nuclear- related facilities are, has denied that the facility is tied to the program in any way. A lone suicide bomber on a bicycle blew himself at a check point on a road leading to the complex, around 30 miles from Islamabad. Police officer Akbar Abbas blamed the Taliban for the attack. The seven dead included two security troops, while 13 people were wounded. The complex at Kamra or its workers have been targeted at least once before. 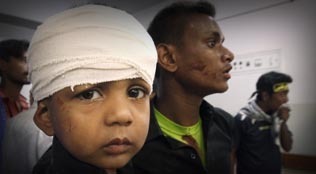 In December 2007, a suicide car bomber struck near a bus carrying children of Pakistan Air Force employees, wounding five of them. PESHAWAR: Fifteen people sustained injuries in a remote control car bomb blast happened in Peshawar’s posh locality of Hyatabad. Sources said the explosion occurred in a car parked outside a restaurant in Phase 2 of Hyatabad. Gunshots were also heard after the blast. Police officials and rescue workers reached at the blast site and shifted wounded persons to Hyatabad Medical Complex. Police have cordoned off the area. Law enforcement agencies have arrested a suspected man and shifted him at undisclosed location for interrogations. The sources of Bomb Disposal Squad said the blast carried out through remote control device in which 40 kilograms of explosive was used. ISLAMABAD: The military said Friday that the death toll in a major military assault on the Taliban in Waziristan rose to more than 160 on the seventh day of intense fighting in the region. Thirteen militants, including six Uzbeks, have died since the last death toll, bringing the overall number of insurgents killed to 142, a statement said. In addition, two soldiers have been killed in the offensive around South Waziristan, where authorities say scores of al-Qaeda and Taliban-linked attacks have been masterminded, bringing the overall number of dead soldiers to 20. PESHAWAR: Security forces have killed 19 militants and arrested 41 suspected terrorists in Khyber Agency, Mohmand, and Lower Dir. In an operation security forces killed 4 terrorists and destroyed 4 vehicles at Gorgari in Kyber Agency, FC media cell reported. Meanwhile, 25 suspected terrorists were detained during a search operation in Shalobar, Tehsil Bara. Security forces also conducted operation in Mohmand Agency, killing 15 insurgents and injuring 14 at Kozchanari, Ghanamshah and Ziarat. Two shops and ten terrorist hideouts were also ruined in the operation, while 14 terrorists have been caught at Lal Qila and Mira Mai, in Dir district. Courtsey: Dawn, The News, AFP, AP.